I am struggling to find a solution for the project I am working on. The circuit is powered directly from two 3V lithium batteries connected in parallel. The average power consumption of the circuit is around 10-20uA with some short current bursts up to 200mA. The circuit consists out few peripherals (BLE, MCU & etc.) and several indication LEDs. LEDs brightness should not vary significantly. System operational voltage is from 2.5V to 3.2V (estimation from the battery specs, components can handle up to 3.6V). Is there any way to protect batteries from cross charging without a significant increase in power consumption of the circuit? And without significant voltage drop? The best simplest and cheapest way to drive the LEDs (10-20mA LEDs) with a forward voltage of around 1.9V to 2.1V. As when the battery is new the current will be higher and brightness will be higher and vice versa. So at 2.5V brightness will be significantly lower. 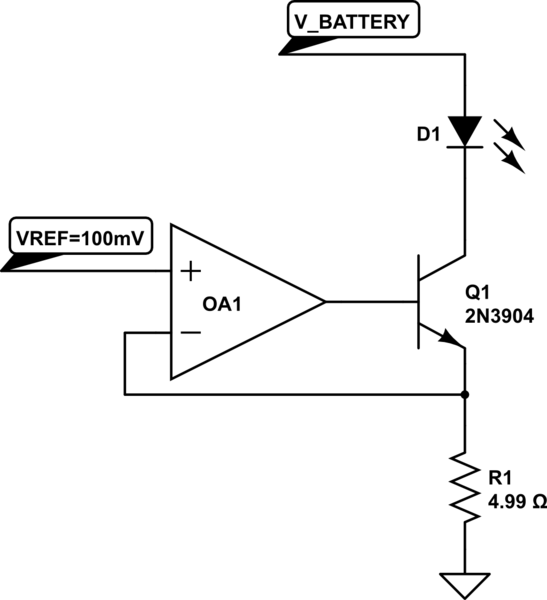 Any kind of low power LED driver with the low quiescent current. Any suggestions? Why don’t you put the batteries in series, use a buck converter, aim for the lowest system voltage to squeeze out max. Battery life, so aim for 2V5? This way you have no cross charging and your current problem with your LEDs doesn’t exist anymore as it’s constant voltage. Also 2V5 seems like a high-ish system voltage for BLE and MCUs, are you sure you can’t go lower? LEDs probably are the driver here. 1) Analog devices/linear tech makes ideal diode controllers that can be used to parallel power sources (such as two batteries). Unlike regular diodes these controllers use a FET and a comparator, so the voltage drop is only mV instead of 0.7V. The controllers can consume as little as 3.6uA current depending on which one you pick. 2) For the LEDs you can use a voltage reference, a transistor and an op-amp to create a constant current source. The LED brightness will then be the same with old or new batteries. How big should battery be to power two strips of led for few hours? Alkaline Battery for Boost converter for 1000ma current requirement?